A couple of weeks ago I traveled to California for a combination of work and family activities. It was the first multiple-day trip since the reboot began, and I was interested to see how I could hold things—anything—up while on the road. Bookends of this trip were a few days at my sister Debra’s house in Los Gatos, the affluent suburb of San Jose. Debra is very health and food-focused and prepares or cooks more than 95% of her family’s weekly meals—and has done so for the nearly 25 years she and her husband have been married. Her style has morphed over the years, integrating her own preferences (earthy, hearty, nutrition-forward food) to accommodate dietary preferences of, first, her Israeli husband, for many years a vegetarian, and now, her eldest son, Teva. 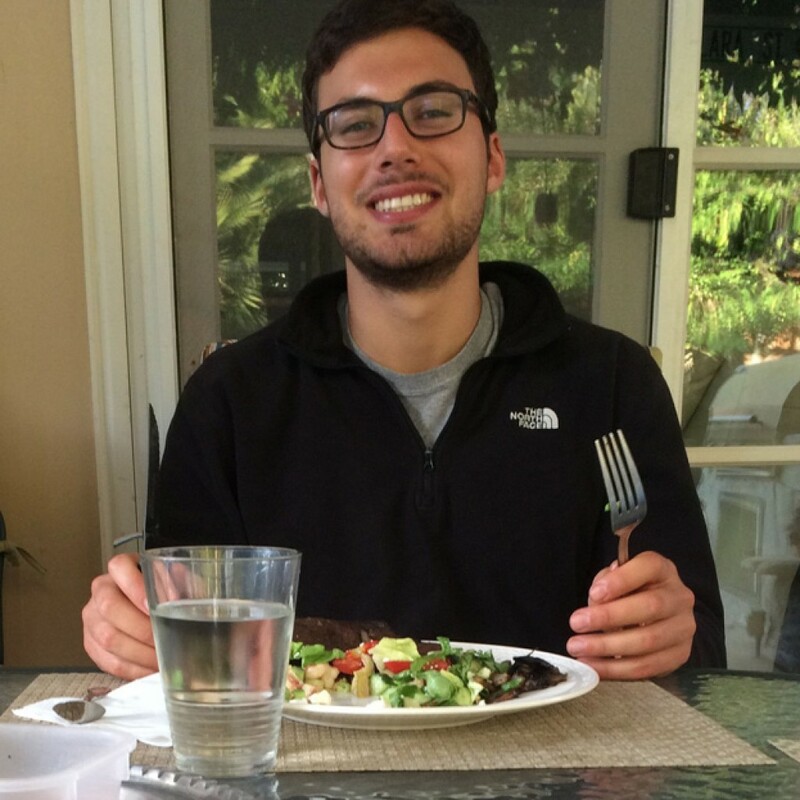 Beginning in high school, about four or five years ago, and continuing strongly through his first two years of college, is Teva’s devotion to human performance, starting with his own: he’s an athlete, a certified cross-fit trainer, and a devotee of the paleo diet. Lots of meat has made its way to Deb’s stove, oven and grill in recent years. Aviv, the younger son, my other nephew, whose high school graduation was the focal point of the family part of this trip, has been a white-food-loving guy, with salads a regular and welcome diversion. He’s into meat too, and now some fish, and apparently just complimented my sister on her healthy food regimen, a possible first reflection on what it may be like to eat away from home, at college, next year. My sister has long been a fan of CSAs and has subscribed to a particular one for many years. “Her” farmer is not farming this year, due to the recent death of his wife, and I think my sister, soon facing an empty nest, briefly considered calling him up to offer to farm with him. As her kids grew, and their appetites increased, my sister has incorporated copious amounts of bulk shopping to her local food purchases: Costco features prominently in her weekly routine. This kind of shopping has definitely shaped my sister’s patterns and scope of ingredients that make their way to meals. Nearly two years ago, when I was teaching the Farm to Table immersion course at ICC Campbell, I returned from visiting Monterey Bay with a new CSA opportunity: seafood. Local Catch, a brand new Community Supported Fisheries, was just starting up. They were looking for drop off locations around Los Gatos, and I asked my sister if she was interested—and she was! The opportunity was right up her alley – be the advocate for some good food to her friends and neighbors and agree to house the place where there is now always a cooler outside with a sweet chalkboard and messages to and from members and the fishery, which recently changed its name to Real Good Fish. My Reboot on the Road got a great boost when I was asked to cook up a bag of ridgeback prawns that another member didn’t pick up. Deb and Teva struggled with their bag, as the prawns need really good cleaning, which requires tremendous patience. 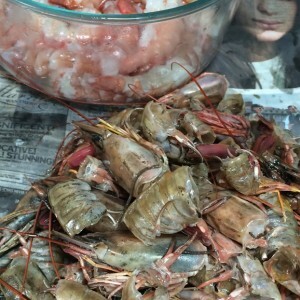 I was eager to take on the task, as I knew the prawns would transform from dirty, inky, antennae-laden beings into bright orange, curled-up pieces of deliciousness. But they did indeed take a very long time to clean. Decapitation and “de-tailification” was easy, but I needed two passes to remove the vein—or were there more than one? I had lots of time (35 minutes) to think about the rest of the dish. 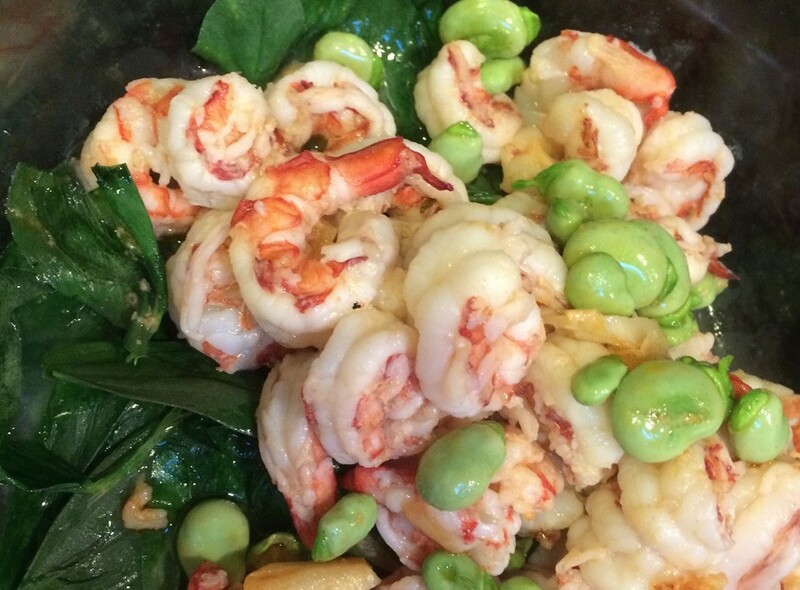 This is what I came up with: sautéed prawns tossed with baby fresh favas, fava leaves, and garlic. The one pound bag served up just enough for the five of us to have a sampling with dinner – steak, of course.